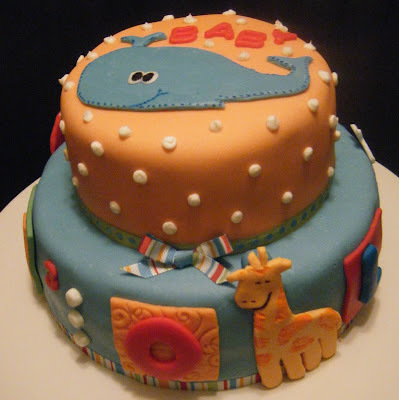 Whatever Whimsy: Let Them Eat Cake! Here is my latest cake. 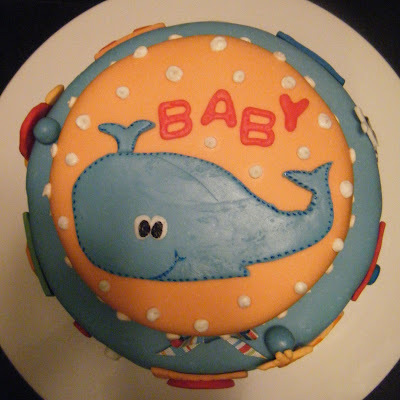 A commisioned baby shower cake to match the "Alphabet Soup" nursery decor line. This was a fun cake to make! I am including a recipe for Marshmallow Fondant, which has become a real favorite of mine. It takes a little time to prepare, but it is so much fun. It's like Play Dough for cakes! Heat marshmallows and water in a large bowl in the microwave for about 3 minutes, at 1 minute intervals, stirring in between. Transfer marshmallow mixture to stand mixer bowl that has been sprayed with cooking spray. Add 1/2 of sugar and 1/2 of shortening to bowl and mix on lowest speed with dough hook. Once incorporated, add remaining sugar and shortening. Turn onto silicone rolling mat and knead until smooth with hands well greased with shortening. Color using paste food coloring. Now you are ready to roll and create! Lot's more on playing with fondant to come, I am sure! 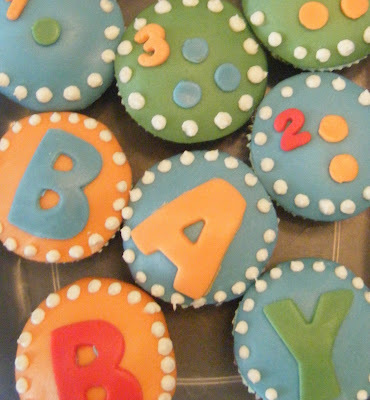 Here are a few letter and number cupcakes I threw in for good measure. Cute, cute, cute. Now, you have seen fondant on cake, you've seen fondant on cupcakes, what next.....? After finishing my cake I was playing with the leftover marshmallow fondant on, did you guess it?, ...sugar cookies! Be sure to come back for the fabulous results! I am soooo very excited to share how these came out! I really think I am on to something! Marilyn - we love the baby cake and cupcakes. Hoping to see more...especially shells and a vase of flowers! Deni & Elijah want to say: i like your baby cake and cookies. they are cool.